The 2017-2018 Willie Brown Teacher of the Year has been named, and it is none other than the amazing Mrs. Waddell! A teaching veteran of 29 years (20 of them at Willie Brown! ), Mrs. Waddell has taught first grade for every one of those years. When asked what her favorite grade to teach is, she did not have to think very long. Her answer: "First grade, of course!" Why has Mrs. Waddell always chosen first grade, you might ask? "As a first grade teacher, I see the growth of all first graders. It’s unbelievable what these kids can do by May. It is truly a joy to see the amount of knowledge these kids soak up. They are like little sponges!!" That joy is her favorite memory from year to year, and it serves as her constant source of inspiration for teaching. This may help explain, too, why Mrs. Waddell has never pursued any career other than education. From childhood to the present day, teaching is all Mrs. Waddell has ever wanted to do. "I knew I wanted to be a teacher since I was a little girl. I would line up my baby dolls and stuffed animals and 'teach' them using my mom’s cookbooks as my teacher’s editions." When she is not at school, Mrs. Waddell is a wife of 18 years and a mom to two sons who represent Legacy High School on the golf team. Golf is a family sport, and Mrs. Waddell shares, "We are quite busy 'golfing' with them and enjoy every minute of it." 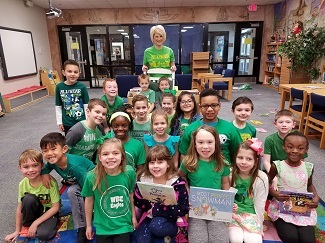 Mrs. Waddell will retire from teaching at the end of this school year, and, while she may be at home or on the golf tour, her heart will always be here...with her students and with us. Congratulations to Mrs. Waddell, our 2017-2018 Willie Brown Teacher of the Year!